Oil-based paints have definite advantages over latex paints. They are usually better stain sealers, and they are more effective at holding onto metal surfaces. A wall coated with oil-based paint will usually be easier to clean, which is why oil-based paints are often used in high-traffic areas. Cleaning oil-based paints off brushes and rollers can be easy as well, with some simple preparation before you start painting. Prep your brush before you start painting to make cleanup easier. Pour some paint thinner into a small dish and lightly dip your clean brush in it. Shake the brush over spread out newspapers to get rid of any excess liquid before dipping the brush into the paint. If you take a break during painting, keep the brush out of the sun so the paint does not harden. Soak a clean rag in paint thinner and wrap it around the bristles, then drop the brush in an old coffee can and put on the lid until you're ready to paint again. To clean a paintbrush, wrap several sheets of newspaper around it. Use your hands to squeeze from the metal part of the brush all the way up to the top of the bristles. Throw away the newspapers. 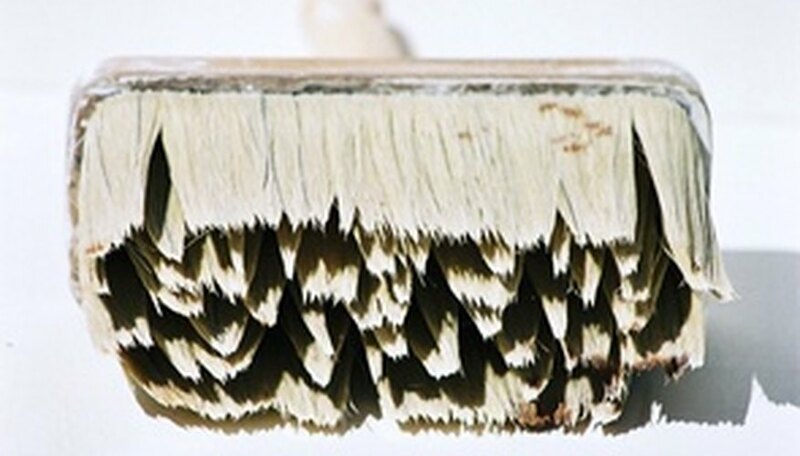 Dip the brush in a jar of paint thinner, running the bristles along the bottom of the jar to help clean off the paint. Take out the brush and wrap more sheets of newspaper around it. Squeeze again, this time to remove the paint and the thinner. Properly dispose of the newspaper. Store a clean, still-damp brush by carefully wrapping it in a paper towel. As the brush dries, the wrapping will help the brush hold its shape.